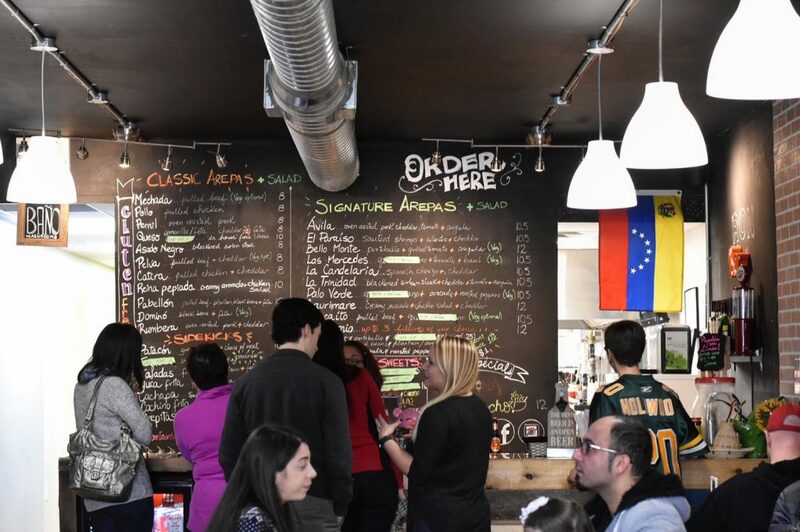 On the weekend, Mike and I got a little taste of Venezuela at the new(ish) Ávila Arepa Urban Venezuelan Kitchen on Whyte Ave! Avila Arepa Urban Venezuelan Kitchen in Old Strathcona. Ávila Arepa is a family-run restaurant located at 10760 82 Ave (Whyte) in Old Strathcona and specializes in dishes called ‘arepas,’ a popular and traditional Venezuelan corn-based bun typically filled with toppings like beef, chicken, pork, or vegetarian toppings like avocado or black beans. 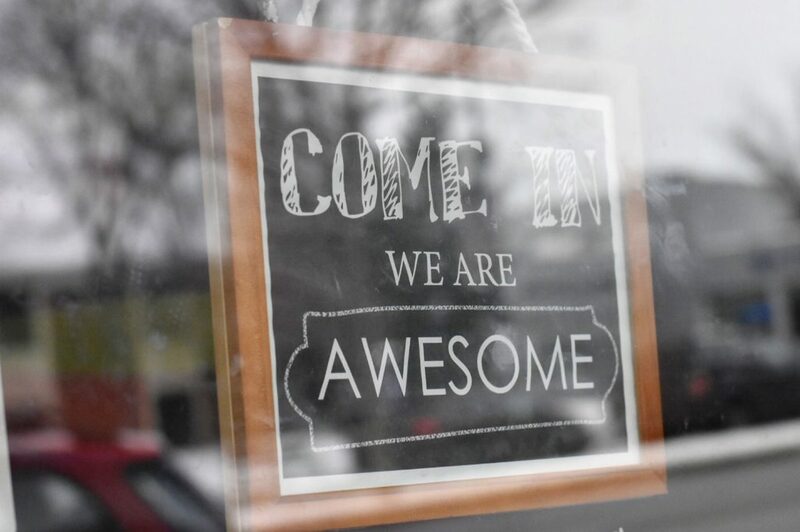 The awesome sign on Ávila Arepa’s door. Arepas are like the Colombian equivalent to Mexican tacos, or Salvadoran pupusas! 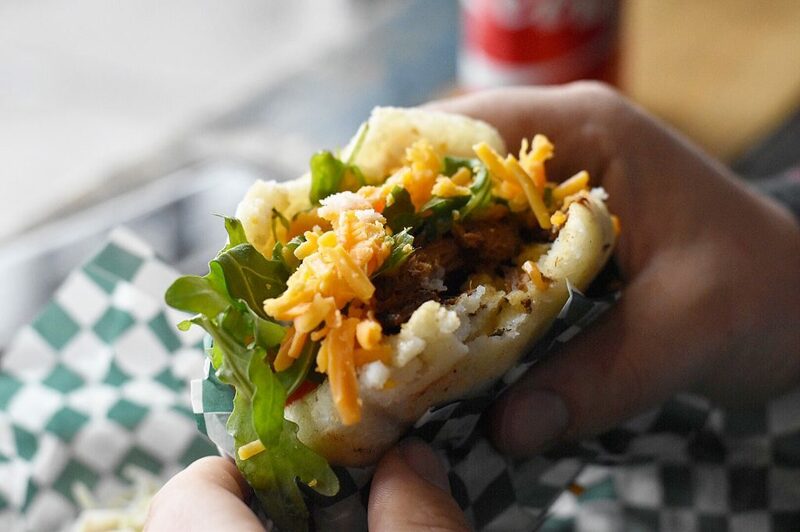 (If Taco Tuesdays are a thing, can Wednesday Arepas be a thing? lol). The restaurant describes these tasty, gluten-free buns as Venezuela’s gift to the world. Thanks for these gluten-free gifts, Venezuela! 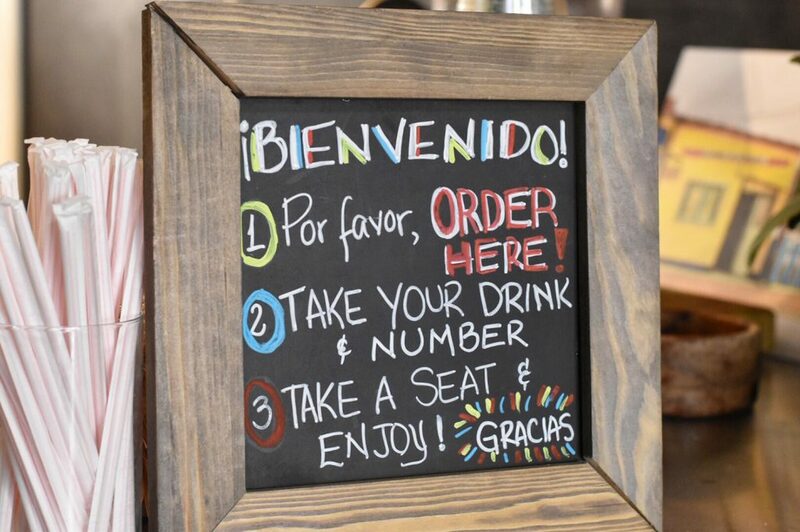 At the fast casual Ávila Arepa you order and pay at the counter and are given a number to take back to your table. How to order Avila Arepa. When we went on a Sunday afternoon, the restaurant was packed! Waiting in line took a bit of time get to the front and get our orders in, followed by the wait for food, so I’d say service felt on the slower side, but it was nice to see how many Edmontonians were choosing to have this comforting, authentic Venezuelan food for lunch! 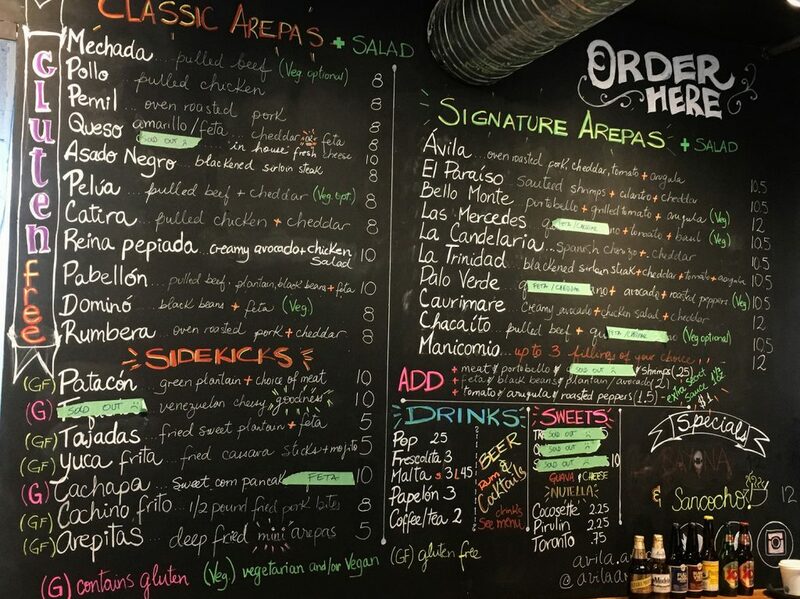 Ávila Arepa’s menu is divided into Classic Arepas, Signature Arepas, Sidekicks, Drinks and Sweets. There are so many options, it was hard to pick! The menu at Avila Arepa. 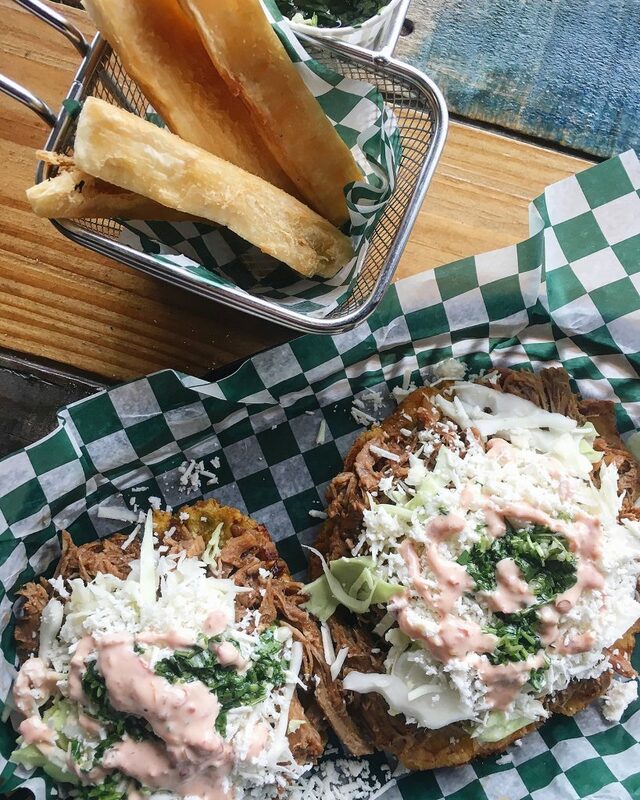 Some Classic Arepas include the Carne Mechada (pulled beef), Polle Mechado (pulled chicken), Pernil (oven-roasted pork), Amarillo (just cheddar cheese!) Reina Pepeada ‘The Queen’ (creamy avocado) and the Domino (black beans and feta cheese). Classic Arepas range from $8 to $10. Some Signature Arepas include the the Ávila (oven-roasted pork with cheddar, tomatoes, and arugula), El Paraiso (sauteed shrimp with cilantro, cheddar cheese and spice sauce), La Trinidad (Sirloin steak, cheddar, tomatoes, arugula), and the Caurimare (creamy avocados, chicken, and cheddar). 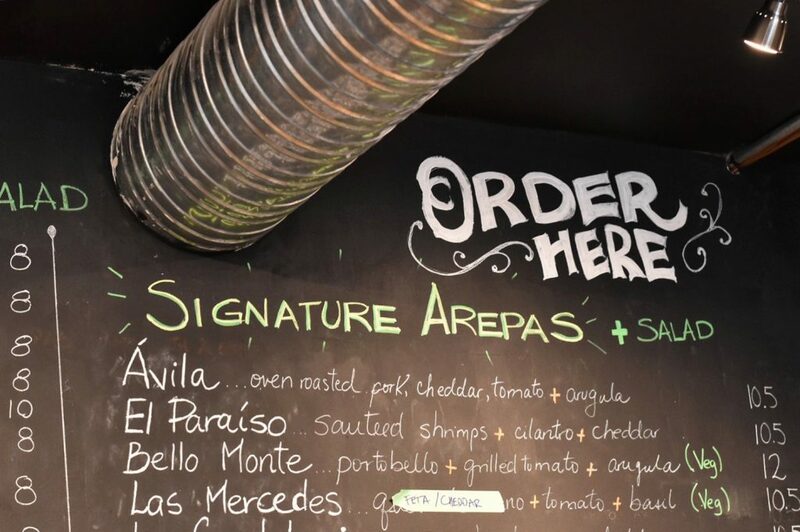 Signature Arepas range from $10.50 to $12. There’s quite a lot of variety so I feel you can really find an arepa for everyone here! Ávila Arepa’s Sidekicks all sound tasty too – from the Patacon (fried green plantain patty topped with your choice of beef, chicken or pork) to the Tequenos (Venezuelan cheesy goodness – that’s the literal definition lol), to the Yuca Frita (fried cassava sticks) and Cochino Frito (crispy fried pork bites). The gluten-free Patacon fried plantain patty with your choice of meat (we chose beef) is $10 which makes it one of the pricier Sidekicks. But it’s also a large enough portion that it could be your main. It’s a pretty hearty, delicious helping. 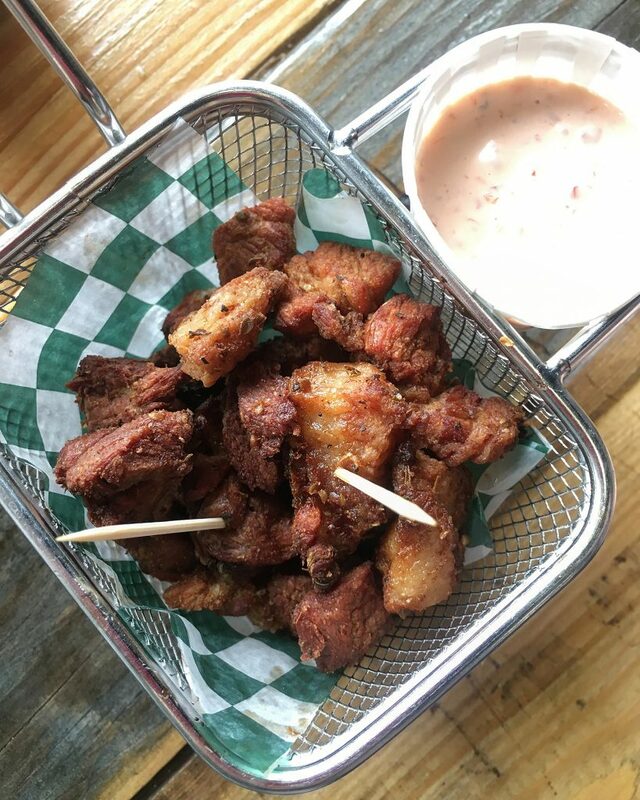 At $5, the Yuca Frita cassava fries are good but I’d recommend using your dollars towards the Cochino Frito which is a 1/2 pound of truly delicious, flavourful pork bites ($8). 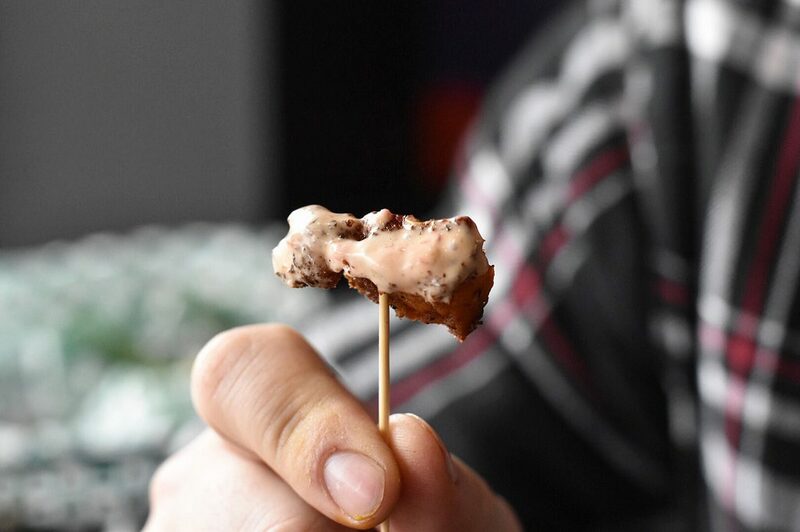 A thousand more of these pork bites please! Mike and I each had our own Arepas for our mains. He got the La Trinidad (sirloin steak, cheddar, tomatoes, and arugula) and how could I not order the Ávila at Ávila Arepa?! (The Ávila has oven-roasted pork, cheddar, tomatoes, and arugula). Both of our Arepas were $10 each. 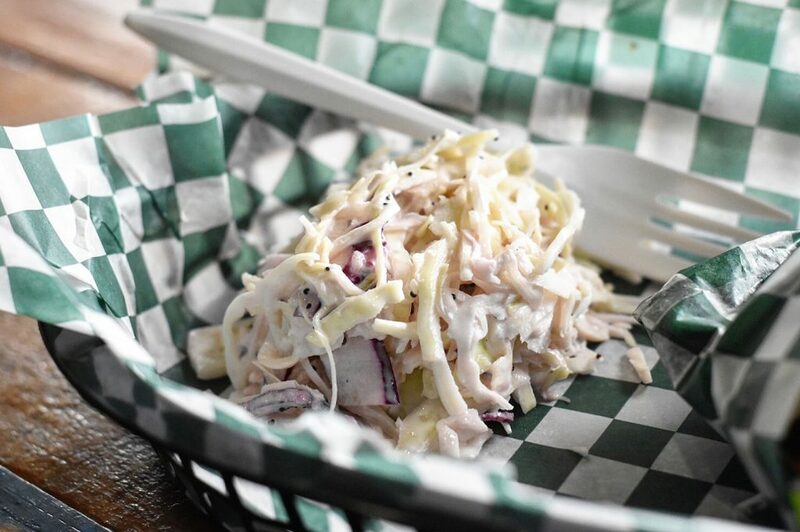 Our arepas also come with a side salad. The La Trinidad Arepa with steak. Had to get the Ávila Arepa at Avila Arepa! We both enjoyed our arepas, though I enjoyed mine more than Mike. He’s generally not a corn bun (or corn tortilla) kind of guy, so we didn’t realize going into it that these would be corn-based (maize dough). We actually ordered our arepas first before asking the lovely server what an “arepa” was and she laughed and said we must be adventurous eaters (for ordering without that knowledge beforehand). 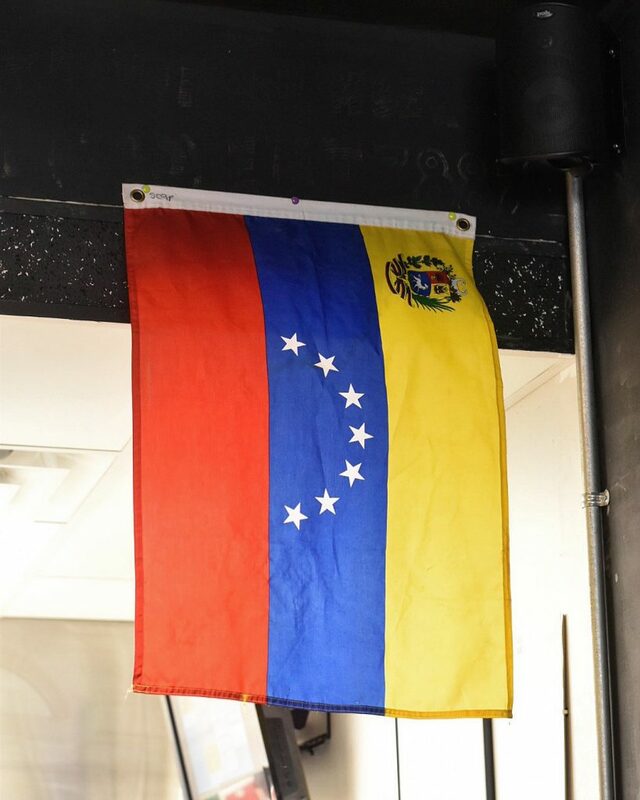 Fun times at this Venezuelan Kitchen! There was also a delicious-looking soup I was eyeing up at another table (which I later saw on Instagram was a Sancocho, a traditional chicken, beef and vegetable soup). Soup is my ultimate comfort food so I’ll definitely be back to try that! In addition to that “cheesy goodness” menu item! 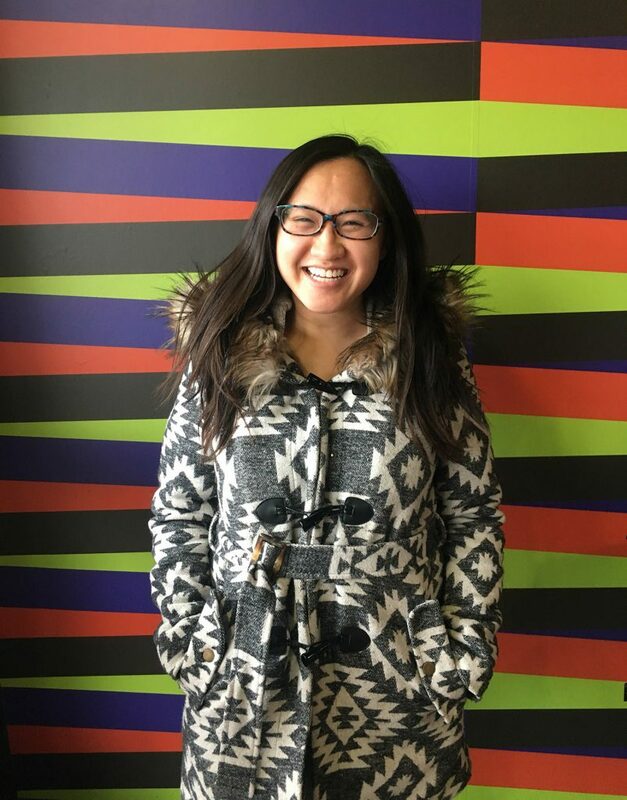 Have to pose for that Instagrammable Wall! 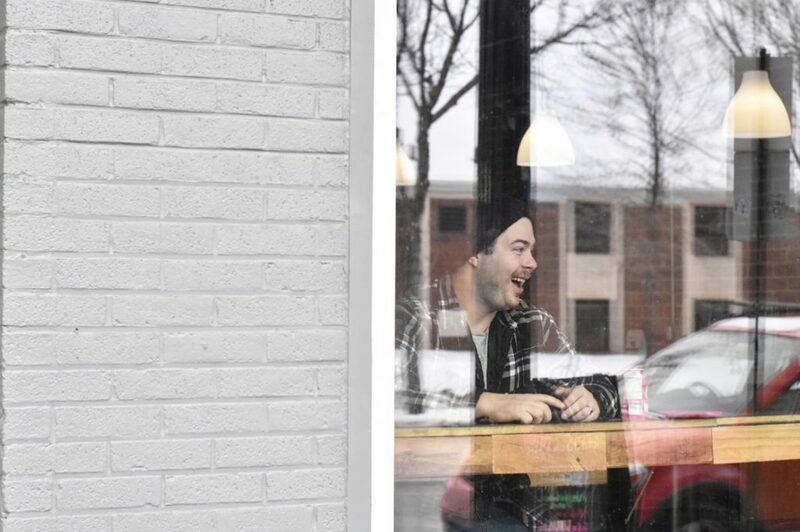 Ávila makes their arepas from scratch, in-house. I love how so many options are gluten-free, and there are so many vegetarian options too! The atmosphere at this restaurant on that Sunday afternoon was quite lively. There was Venezuelan music playing, and it was nice chatting with the servers, who seemed very friendly and very passionate about their food. Because it was so busy though, it did take quite awhile to get our order in. We tried to add additional Sidekicks after our initial order and that took a bit of time as well because of the continued line-ups. Ávila Arepa also has an indoor Instagrammable Wall you guys! It’s right at the door when you enter (and the counter is at the very end of the restaurant, on the other side of the door), so you could potentially pop in for a photo without actually ordering anything (but you should actually just come right in and try some food because it was pretty tasty). 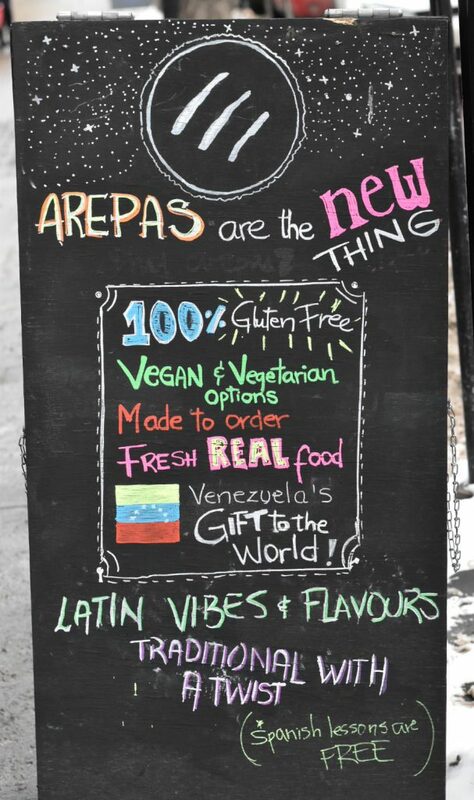 Arepas are Venezuela’s gift to the world! Mike and I have never really had Venezuelan food before so didn’t really have anything to fairly compare the food to. I think for the most part the price points are definitely on the lower end (but adds up when you start adding multiple Sidekicks and Arepas of course). It’s arguable if $8-$12 for one bun is good value (I wouldn’t think that’s great value for a single taco, if we’re comparing that way). However Mike did think the price for what you get is quite reasonable because the arepas are very filling! The arepas are definitely tasty though! 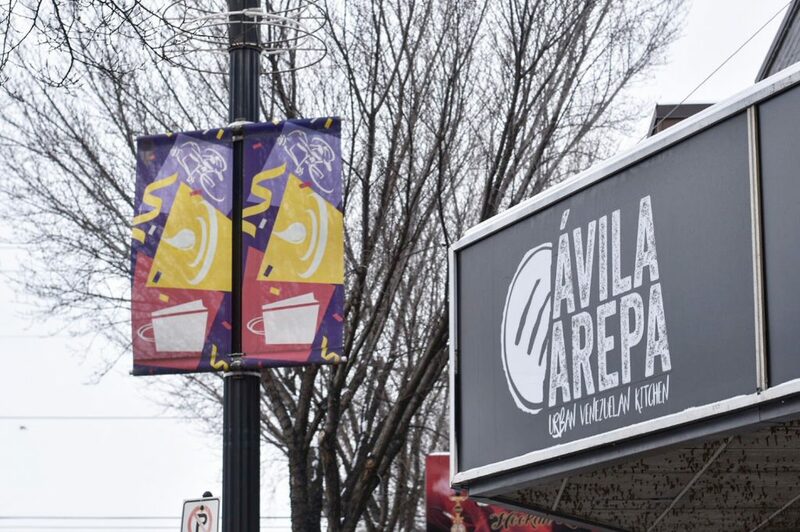 Overall, Ávila Arepa was a fun, casual Venezuelan kitchen to visit, in the heart of Old Strathcona. I love trying new food so this was a great experience. I thought the staff was very friendly, though the service was a bit slow. Overall, the atmosphere was lively and our first go at the food was tasty enough to come back to try the soup, a few more arepas and sidekicks. Mike, with his aversion to corn-based buns/breads/tortillas, probably wouldn’t join me back though. My friend Sharman (who is gluten-free) absolutely loves Ávila (it’s super friendly to gluten-free folks!) and her rave reviews was partially why we stopped in! I just really liked how comfortable and casual the vibe was here. Definitely makes you want to come back! So have you been to Ávila Arepa? What did you think?! i do have a experience with this restaurant, Ávila Arepa is a superb delicious restaurant for family.